I'm looking for information and photographs of the old Clover Field to include on this page. If you have some you'd like to share, please click this FORM to contact me. Thirty-four pilots identified Santa Monica, CA as their "arrived from" or home base airfield; 83 identified it as their destination. The rest came from and departed to different places. You have chosen to enter the suite via Clover Field, Santa Monica, CA. Spend some time here by clicking any or all of the navigation buttons at the top and right of any page. When you are finished, you may come back here and direct your browser to the other sites tabulated, summarized and linked from the table below. In aggregate, these Registers recorded flight activity around the United States from 1925 to 1942. Clover Field was established in Santa Monica during 1922. 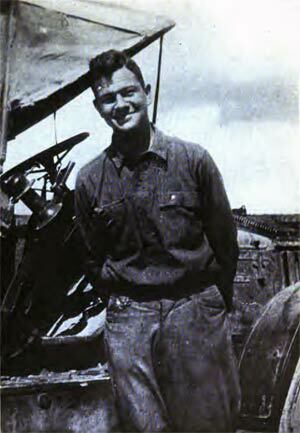 Clover Field was named after Greayer "Grubby" Clover (1897-1918), a Los Angeles native and WWI aviator. Clover was killed in France as a result of a crash during a practice flight on August 30, 1918. Incidentally, a park in East Los Angeles is also named after him, Greayer's Oak Park. Clover authored posthumously in 1919 a book entitled "A Stop at Suzanne's And Lower Flights." The full text of this out-of-copyright book is available at the link (PDF 5.5Mb). It's a great read about a young man's experiences in France during WWI. It is enhanced by chapters written by his friends after his death. The photograph of Clover, right, is from his book. Photographs and information about the old Clover Field are at the Davis-Monthan Airfield Web site at the link. 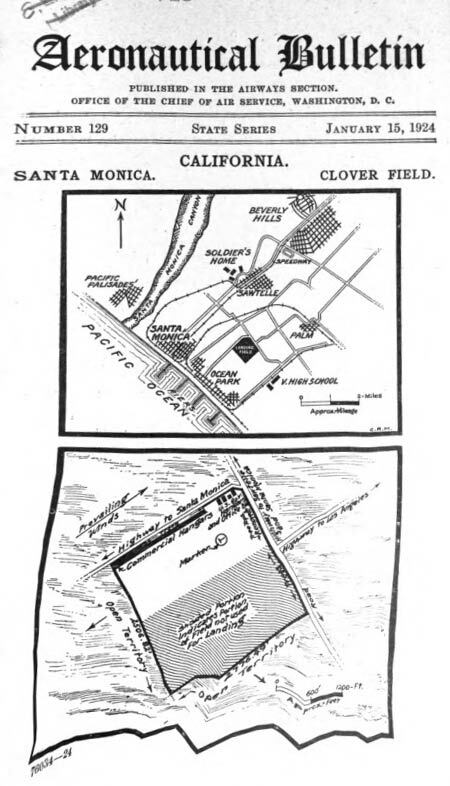 The location of the original Clover Field is today the Santa Monica Municipal Airport (FAA identifier SMO), a "reliever" field for the greater Los Angeles area (but, see below). WHAT IS THE CLOVER FIELD REGISTER? The Clover Field Register was an approximately 11 by 14 inch, two-hole looseleaf book. The book lay open from December 31, 1928 to August 4, 1939; a total of 3,878 days. You may view each of its pages at the REGISTER button at upper right. 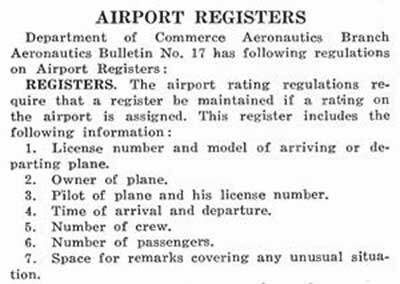 The Clover Register was ruled into rows and columns with headers across a single large page that specified the information for pilots to enter. Below, an image of part of the bottom half of page three with pilot signatures from April 26-May 1, 1929. Note the Navy flier in from San Pedro at 11AM, as well as Howard Hughes' signature fourth from the top flying the Waco he identified as NC3574. The surviving Clover Field Register is 35 pages. There were 798 landings recorded in this Register. The landings were made by civilian pilots (615), military pilots (128) and female pilots (55). As you work through the Clover Field Register, you will probably recognize many of their names besides pilot Hughes. Your Webmaster’s copy of the Clover Field Register was acquired in 2009. Many thanks to John Underwood for facilitating the acquisition, which now allows us to learn about and to build upon our knowledge of the key role Santa Monica played during the Golden Age of Aviation. It is unknown if additional pages existed before or after the 3,878 days cited above. WHAT WAS CLOVER FIELD? As stated at the top of this page, Clover Field takes its name from Greayer Clover. Although the location was used for landings by military and other aircraft as early as 1917, Clover Field was officially dedicated in April, 1923, as documented in the Los Angeles Times article from April 16, 1923, below. 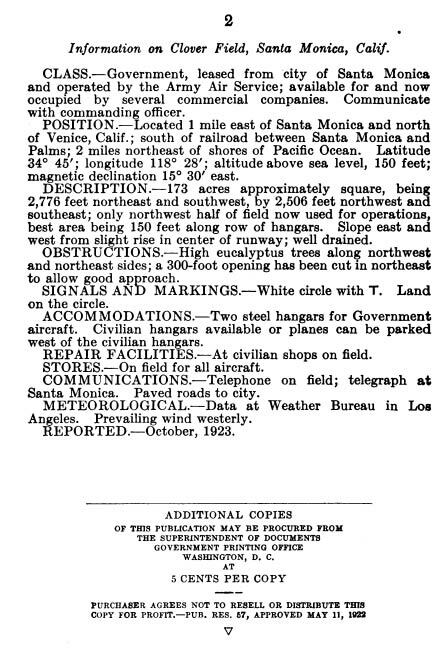 Below is the official field description from the U.S. Department of Commerce (DOC) Aeronautical Bulletin of January 15, 1924, about a year after the airfield was dedicated. The distortion is a scanning artifact at the source. Compare this diagram with the photograph immediately below from 1933. An aerial photograph of the field taken in 1933 from this 1938 REFERENCE is below. The view is to the southwest. 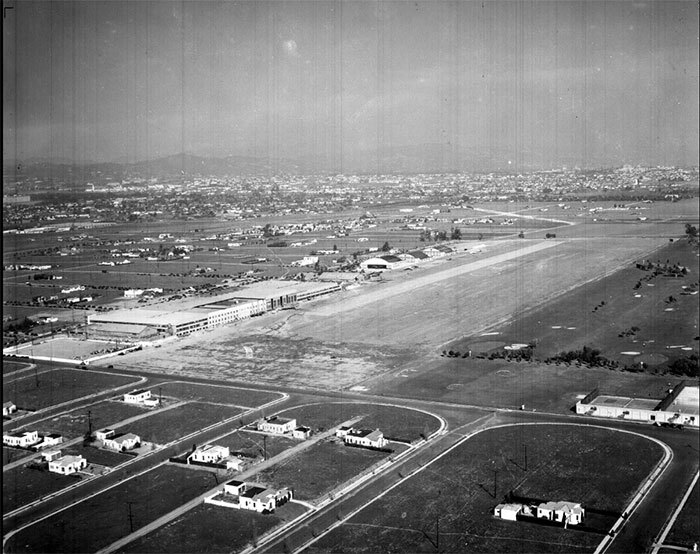 Back in the day, the airport was the home of the Douglas Aircraft company, as well as many other businesses. 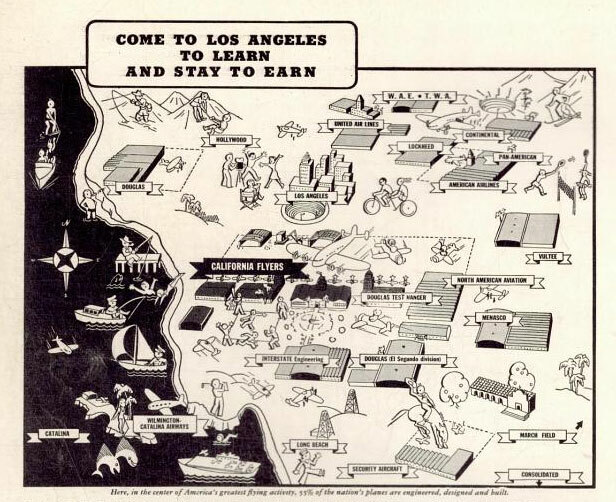 In fact, the greater Los Angeles area was home to the majority of major aircraft and engine manufacturers and training facilities in the country. Below, is a photograph dated December 1, 1934 of Clover Field, courtesy of the Wayne State University Digital Library (WSUDL), Walter P. Reuther Library, Archives of Labor and Urban Affairs, Wayne State University. The view is to the northeast. The large building complex left, center, is the Douglas Aircraft Company manufacturing facility. Please direct your browser to the link to WSUDL, because this image is worth exploring in detail. If you click "Open Image in a Viewer" at the link, you will be able to magnify this high-quality image. In the online image at the link, a DC-3 aircraft is visible about 2/3 of the way along the building. Likewise, another DC-3 can be seen in front of the hangar building north of the manufacturing facility, and "Clover Field" is visible on the roof. Also, the J.E. Granger hangar is visible as the last hangar to the north and the roof is so marked. "Mutual Aircraft" is painted over the door on the hangar just to the left of Granger's. Note the wind circle visible about halfway up the runway (runway 3). There is a golf course adjoining the airport property just to the east. And tennis courts, with players dressed in white, are visible inside the walled area at lower right. Many people are standing in the open area to the southwest of the manufacturing facility. And many telephone poles dot the sparsely populated neighborhoods. Below is an image from Google Earth in approximately the same orientation as the image above. The image is dated April 11, 2015. The golf course is gone, replaced by densely packed homes, which house many of the people who would like to see the Municipal airport closed (see the section on this page titled "An Ongoing Political Battle," below). Below, from Popular Aviation (PA) magazine, March, 1939 is a cartoon rendering of all the significant facilities in the area. Today, there are many Google pages and photographs of the contemporary Santa Monica Municipal Airport. It is pretty much surrounded now by housing and industry. The lat/long coordinates, 34 01N; 118 27W, cited at the Clover Field page linked at the top of this page, define a point at the center of the runway at the contemporary airport. Another image, dated 1937, is at the Santa Monica Public Library at the link. That the women and their exploits were newsworthy at the time is made abundantly clear by the sheer numbers of newspaper and magazine articles and books published. As an example, in one small study I performed, The New York Times published 1,265 articles about female aviators during the 10-year period of the Davis-Monthan Register, an average of three a week. And that is just one newspaper and one small group of aviators. The machines flown were the best technologies of their time, and the pilots used them in some spectacular, innovative ways. Most of their craft lived hard, short lives. Only a very small percentage exist today, and they and their sister ships are featured on the sites. PLEASE NOTE: As of the upload date of this page, the Web site of the Davis-Monthan Airfield Register has been online eight years, since May 4, 2005. It presents over 1,000 pages of pilot biographies and other topics, which have been added incrementally over the years. The new sites have less content now, but they will grow over the coming years. Additions and changes to the sites are always posted at the "WHAT'S NEW ON THE SITE?" links on each site. Please bookmark the "What's New on the Site?" pages and come back regularly. All Web pages are designed by your Webmaster and implemented by The Web Professional, Inc., Naples, FL & St. Paul, MN. All Web sites are wholly owned, researched, written and operated by Delta Mike Airfield, Inc., a 501(c)3 non-profit company based in Naples, FL. Unless otherwise noted, all designs and original texts and images are Copyright © Delta Mike Airfield, Inc. The mission of the company is education, encouragement and support of historical aviation research and multi-media publication to enhance knowledge among public and private sectors around the globe. Specific emphasis is on the Golden Age of Flight. The company operates primarily, but not exclusively, through its Web sites. Other mixed media publications and public appearances also support the Company. Your donations can be made through any of the Web sites. The Santa Monica Airport is under fire from the Santa Monica City Council, citizens and real estate developers for the reasons you can read in the articles and at the links I provide below. If you have information, articles, blog links or other sources that would help save Santa Monica Airport, please let me KNOW through the link and I'll post them below. If you find any of the links below inoperative, please let me know, too. August 2012 The article below was published in the August, 2012 issue of the AOPA Pilot magazine. 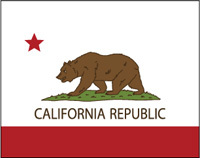 May, 2013 Coincident with the release of this Web site online, the City of Santa Monica, CA has voted to charge landing fees to all aircraft. A blog that follows such matters is at the link and cites on May 1, 2013 the following, "The general aviation industry in the U.S. lost a key battle last night when the Santa Monica city council voted to impose higher landing fees, not just on transient aircraft but on all aircraft that use the airport. Starting August 1 , even a Cessna 172 based at Santa Monica airport (SMO) flown by a local student or rental pilot will be assessed $10.96 for each landing. For training operations, that means a student pilot will end up paying $10.96 for every landing or touch-and-go." July, 2013 The article at this link, "Another Nail in the Coffin" (PDF 226kB) was published in the July, 2013 issue of the AOPA Pilot magazine. On the battle line between aviators with cities, citizens and developers who see airports as real estate for condos, these kinds of usurious fees generally portend the demise of an airport, given that flight instruction and student operations are no longer financially possible for pilots and school operators. If these fees are not voted away, SMO may soon be gone, and the memories of the great Golden Age pilots and aircraft that visited will be just that, only memories. December, 2013 A blog on December 30, 2013 details a law suit by the City of Santa Monica to release the city from its obligation to operate an airport. The ruling on the suit could have implications for the long-term survival of hundreds of other airports across the country, because the Federal government, when it turned the property over to the city in 1948 after WWII, included a term that obligated the city to continue the operation of the airport in perpetuity. The suit essentially ignores that mandate. February, 2014 The suit by the City of Santa Monica failed as documented in the article at the link. Score one for the general aviation public. But, July 1, 2015 may be contentious. May, 2014 Citizens mount a ballot initiative to save the airport in November elections. The Santa Monica City Council mounts a counter initiative. August 24, 2016 The Los Angeles Times published "Santa Monica council votes to close the city's airport by July 2018." September, 2016 The FAA sends a letter to Santa Monica City Council to stop harassing airport residents and businesses, right. October, 2016 The City of Santa Monica generated eviction notices for two Fixed Base Operators who provide fuel and services to transient and resident aircraft at the airport in an attempt to undermine FAA demands that the airport remain open. An article appeared in the AOPA Newsletter of September 29. 1916, below. I have left the links active. Please let me know if the links become inoperative. 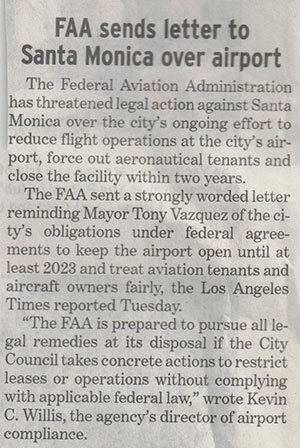 An editorial in the Los Angeles Times of September 24, 2016 supported keeping the airport ("LA TIMES URGES SANTA MONICA TO STOP UNDERMINING AIRPORT"), and for the City of Santa Monica to stop harassing the business there. The FAA is demanding answers from city officials in Santa Monica, California, and is clearly unwilling to accept at face value claims that the city will provide fuel, flight training, and aircraft maintenance services after kicking the current providers out of Santa Monica Municipal Airport. The agency put the city on notice Sept. 26 that it has opened an investigation into the city’s recent initiation of eviction proceedings against both fixed base operators, who received those notices from the city Sept. 15. That was a month after the FAA ruled Aug. 15 that the city is obligated to keep its 2003 promise to “make the airport available as an airport for public use on reasonable terms and without unjust discrimination to all types, kinds and classes of aeronautical activities,” as mandated by federal law for communities that receive federal funds for airport improvements. In separate subpoenas served on city officials Sept. 26, the FAA demanded from the city documents and testimony regarding the city’s stated intention to provide aeronautical services after the current providers are evicted. The subpoenas require the city to provide, among other things, detailed information about which city employees provide or would be intended to provide flight training, aircraft maintenance, and related services. The agency also demands to know what tools and equipment the city will deploy, and where, exactly, it plans to conduct flight instruction, and with which specific aircraft, among other things. The FAA action follows a plea for assistance from Atlantic Aviation and American Flyers, the businesses directly affected by the city’s strategy to circumvent federal law and its obligation to federal taxpayers for promises made prior to and as recently as 2003. The airport serves an important role as a general aviation reliever in the busy Southern California airspace, situated 8 miles from Los Angeles International Airport. AOPA and the National Business Aviation Association have both sought to intervene in a federal court case appealing the FAA decision of Aug. 15 before the Court of Appeals for the Ninth Circuit. Both associations noted that closing the airport would not only affect those who use and base their aircraft on the 227 acres in the heart of the crowded city, but it also would add to airspace congestion and set a dangerous precedent that could jeopardize a system that provides federal funds for airports nationwide. Vazquez and other city leaders have not acknowledged the airport’s $250 million contribution to the local economy, which was documented in an economic study along with the 1,500 jobs the airport directly and indirectly supports. The city has preferred to drive aviation companies out of business, as in the case of the recent eviction notices, or buy them out of business, as it did by paying $450,000 to Justice Aviation to depart the airport quietly in May. The city celebrates the value of tourism on its own website (an estimated 8.3 million annual visitors and 13,500 jobs supported by tourism) without a word about the role the airport plays in facilitating travel to and from this congested metropolitan area. The FAA gave the city 10 days to respond, and demanded in-person testimony on Oct. 12 to explain how the city plans to live up to its obligations after evicting all providers of aeronautical services. The agency noted various actions taken by the city including limits on fuel sales, adoption of an airport leasing policy that has led to the denial of leases to aeronautical service providers, and a city council vote to close the airport in 2018, or sooner, if legally permitted. “These actions may be causing, and appear intended to cause, impairment of the airport, including but not limited to, a de facto closure of the airport in violation of applicable law,” the agency wrote, noting that the city would normally have 30 days to respond but, under federal law, the FAA shortened the time to 10 days under circumstances that require an expedited response, including the Oct. 15 deadline to vacate imposed by the city on both FBOs. “The FAA strongly recommends that the City withdraw the notices to vacate until such time as this matter can be resolved,” the agency added. February 2, 2017 The City of Santa Monica and the FAA reached an agreement whereby the Santa Monica Municipal Airport would remain open until December 31, 2028. The article below was published in the February, 2017 online issue of the AOPA Pilot magazine at the link. I include the entire text in the box below in case the Web version becomes archived. The Web version has photographs. This is a positive step, time-wise, to protect the life of the airport. However, shortening the runway will abridge the types of aircraft that safely can use it. February 2, 2017 By Alyssa J. Miller. A deal between the FAA and the city of Santa Monica, California, became official Feb. 1 when the Honorable John F. Walter of the U.S. District Court for the Central District of California signed a detailed stipulation and order/consent decree that requires the city to keep Santa Monica Municipal Airport open and operating with reasonable services until Dec. 31, 2028, upon which time it has the option to close the facility. The agreement has upset many on both sides of the battle over Santa Monica airport. “There’s an extended period of time for the market to adjust,” said FAA Administrator Michael Huerta in an exclusive interview with AOPA, “but frankly there’s also a period of time for the industry, for the city, and the aviation community in Southern California to perhaps think about alternatives that might be out there as well.” Huerta suggested that the aviation community consider presenting alternatives to closing the airport to the city during the interim. “Twelve years is a long time and it does provide, I think, a framework for those discussions to take place,” Huerta said. 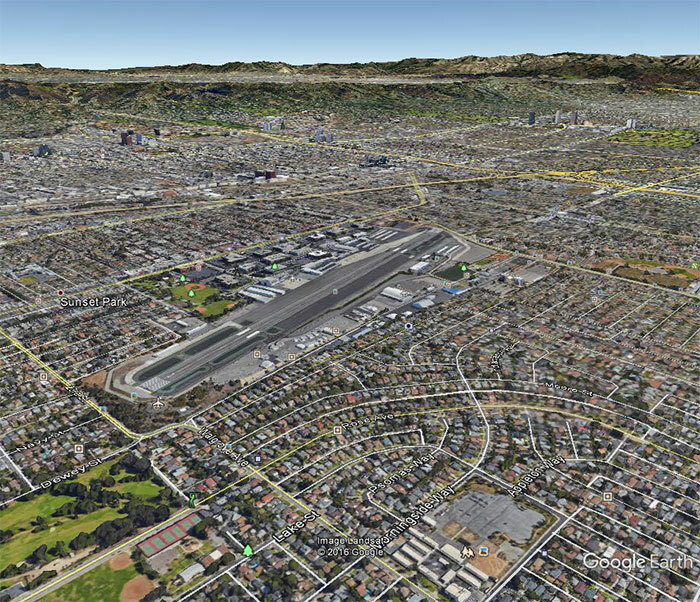 The settlement agreement allows the city of Santa Monica to shorten its 4,973-foot runway to an operational length of 3,500 feet after providing 30 days’ notice. The runway safety areas at both ends of the runway are not included in the 3,500 feet, but the agreement does not define the length of those safety areas. The city will be responsible for the cost of shortening the runway but can still apply for federal funds through the FAA, as other airport operators can. The city can either provide airport services itself, such as fuel sales, or enter leases with tenants to provide those services. If the city offers leases to tenants, they must have a three-year minimum, and all terms must be “reasonable” to those provided at other airports similar to Santa Monica. No hard limits were set on fuel prices or landing, ramp, or hangar or tiedown fees. Huerta said the FAA would not get “in the business of setting prices,” explaining that “reasonable and customary business practices are what we’re going to be looking for in terms of how the city operates the airport there.” He encouraged airport users to talk to the city about prices and their needs because the city now has an incentive to operate the airport because it must remain open until the end of 2028. The city and the FAA have engaged in litigation for more than three decades regarding the airport’s future, Huerta noted. The litigation surrounded two types of contracts the city of Santa Monica and the federal government had entered. One was a difference of views between the two entities as to when the contractual obligations for operating an airport after accepting federal funding expired. Federal grant assurances require that airports remain open and operating for 20 years after funds have been granted. The city of Santa Monica had received federal Airport Improvement Program funds in 1994 and then additional funds through an amendment to that grant in 2003. The point being contended was whether the 20-year period expired in 2014 or if it would remain in effect until 2023. The other point of litigation regarded whether the airport must be operated in perpetuity and is related to two contracts at the end of the 1940s, when the federal government stopped using the airport for military purposes after World War II. The city and the FAA had been in negotiation since 2016, Huerta said, when the ninth Circuit Court of Appeals overturned a district court’s decision granting the FAA’s appeal to dismiss Santa Monica’s continued bids to close the airport. That unfavorable ruling for the federal government helped spur the agency to open discussions with the city. Huerta said the parties had to negotiate the city’s rights to its land and the aeronautical obligations to the government while providing a level of certainty and extended operations for tenants at the airport. Contractual compliance with grant assurances had been the FAA’s interest when it issued a cease-and-desist order late last year after the city of Santa Monica issued eviction notices to Atlantic Aviation and American Flyers. The settlement agreement resolves all pending disputes between the city and the FAA. With many airport operators and the entire general aviation community following the Santa Monica case to determine what any decisions could mean for airports elsewhere, the settlement does not set a precedent, according to Huerta. “It is an incredibly complicated situation, a very unique set of facts that relate to Santa Monica,” Huerta said. Because of the settlement, the courts never ruled regarding federal surplus property being returned to cities, he said. Huerta also explained that the length of grant assurance obligations was never a question; Huerta clarified that the lawsuits over the grant assurances were based on a difference in opinion of the expiration date, not on the length of the obligations in general. He also said the agency would continue to ensure that airport operators comply with the contractual agreements they commit to when accepting federal funding. “I don’t think it sets any precedent,” Huerta said. June 1, 2017 CITY OF SANTA MONICA VOTES TO SHORTEN RUNWAY. October 14, 2017 Your Webmaster and Delta Mike Airfield, Inc. announce the availability of a new book for 2017. “Clover Field: The first Century of Aviation in the Golden State” is available in paperback at Amazon at the link. Perfect-bound, 281 pages with black & white photographs. This book supports the preservation of the Santa Monica Municipal Airport through appreciation of the history of Clover Field. Santa Monica Municipal Airport in California has reopened following completion of the second phase of a project to shorten its Runway 3/21 from 4,973 feet to 3,500 feet. On the airport’s reopening the morning of Dec. 23 after a 10-day closure, multiple notices to airmen were in effect advising pilots of changes to the airport’s layout, operational procedures, and runway amenities such as visual approach guidance equipment on Runway 3. The reduction of the runway’s length was part of a deal secretly negotiated between the city and the FAA that may allow the city to close the airport in 2028, which AOPA opposes. According to a Letter to Airmen from the Santa Monica Tower, only the VOR-A instrument approach, and visual approaches, will be available until Feb. 1, 2018. All RNAV departures remain available, it said. The letter advised that distance remaining signage will be located at 1,000-foot increments south of runway 21. It advised pilots to expect to exit the runway at designated taxiways only, and it listed the locations and designations of new and existing taxiways. The FAA urged pilots to request clarification from the Santa Monica control tower when necessary; to ask for help “at any time they are uncertain or think they need additional assistance”; and to review notams before operating at the airport. AOPA remains determined to keep Santa Monica Municipal Airport open past any secretly negotiated date that might allow closure of the airport, and continues to urge supporters of the airport to work to elect city council members who understand the value and the need for the airport and will support its continued existence long past 2028. The association recommends that pilots remain vigilant for other possible procedural changes and exercise caution in their operations on the airport during its transition to the new configuration. February 9, 2018 SEISMIC STUDY BOLSTERS SANTA MONICA AIRPORT'S ROLE IN DISASTER RELIEF. New and revised earthquake fault zones mapped by the California Geological Survey—including a newly identified Santa Monica fault boundary—reinforce aviation advocates’ assertion that Santa Monica’s embattled airport could play a lifesaving role in disaster-relief operations if a major earthquake struck the area.